Doesn't life sometimes feel like your out in the middle of the open waters. You're doing everything you can to stay afloat despite the waves and squalls surrounding you. These past couple of weeks have felt that way emotionally, physically, and spiritually. Each wave is another thing, chore, responsibility, decision that is calling for our attention. Trust me, I am blessed, and thankful for my job, the people in my life, and the places I have to go to. But anything, even good things, when there's too much of it calling for your attention, can be draining. Every week I try to post a positive blog, to inspire people. In all honesty, its difficult to post positive things when life seems so crazy and uncertain. So hopefully you who are reading this can relate, and feel good that other people are experiencing this too. So for now, I'll take a deep breath, get ready for another week, and stand firmly behind my faith that God is good, and will direct my steps. 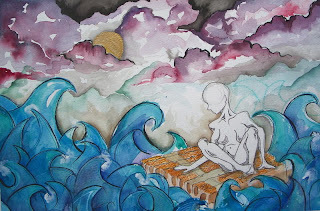 This painting is one I did a few years ago appropriately titled "Open Waters".